This study has become like the Nasdaq/silver analog from last year - Why second guess it? It went from appearing to diverge in performance to catching up in a few large moves. I suppose we will find out early next week if it continues to hold prescience at pivots. I could see the right "shoulder" on the stochastic start developing early in the week and true to form it has replicated in similar fashion. 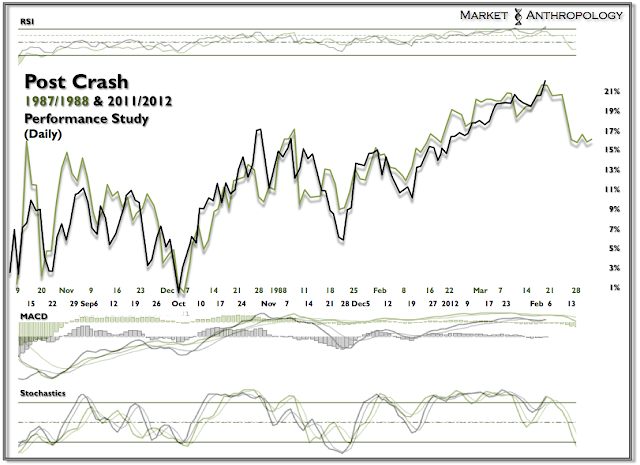 It is interesting though that the RSI did not provide the negative divergence that the analog exhibits at its pivot.